Single Girl Gourmet: Urban Gardening: Update! I'm just getting started getting things planted in the garden. I was surprised how late the last frost in DC is! I also did not want to plant things right before I left on vacation, so I had to wait. It was torturous passing all the plants Home Depot had on display every day on my way to and from work. But now, I have plants. And a growing awareness that I don't have a clue what I'm doing. I felt a tiny bit overwhelmed surveying all of my options for pot sizes, tomato varieties and potting soil. By the way does anyone know if there is a USDA standard for organic potting soil? I could not figure out if there actually was a difference looking at the package. I'd rather use something the compost-derived nitrogen than petroleum. Please let me know if you have any information. 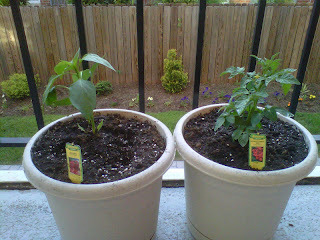 I decided to start small, I bought two pots which I hope are big enough (the next size up looked huge) a cherry tomato plant and a red pepper plant. I felt that I was most interested in these vegetables and they would take longest to fruit, though why I thought that I have no idea. I took my plants, soil and pots home and set to work. I gingerly placed my plants in there new homes on top of lots of soil. I sent my sister, an avid gardener, a photo of my accomplishment. Later, when her and I were talking on the phone, she basically told me I screwed it all up. Apparently, I should've broken up the roots when replanting them, so that they take better to their new home. Apparently, there are also varieties of tomatoes bred for growing well in pots and I should have looked for one of those. Oh well, good thing I only started with two plants. Hopefully, they will still turn out alright.